When I was maybe 12 years old, Gram and I would walk downtown for lunch at the local department store. Yes, you heard right. Department stores used to have their own built-in restaurants. Ironically, while that store is now long gone a restaurant is now housed in that same location and whenever I eat there, I can't help but think, "This used to be the shoe department where I would throw a fit and kick the salesman whenever he tried to place a shoe anywhere near my foot." I can remember us walking past a deli and I saw something completely new to my young eyes. Giant strawberries the size of my 12 year old fist covered in chocolate. "Gram, can I have one of those?" Dipping into her pocketbook, (the one that always had a few fuzzy butterscotch candies at the bottom) she bought one for each of us. Taking a huge bite, she must have seen my eyes widening in delight because she said to me, "Next time, I'll make these for you." And that she did. Every year she would buy all of the leftover chocolate Easter bunnies from the drugstore down the street and melt them over a double boiler on her stove. She'd dip one strawberry after another and place them wax paper then into the fridge to cool. Not long after, I'd pull the plate from the fridge and she would let me eat every single one. Gram loved me and I loved her. She would have been 87 today. Awesome. I think the bunny melting had to have made them even better! 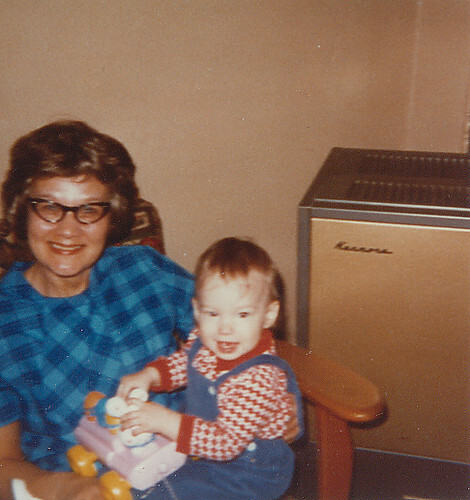 Your post brought back memories of my childhood in the early-1970s. Malls had not yet taken hold and shopping meant a walk into 'town.' There we'd visit Woolworth's (then the biggest store on our Main St) and maybe - just maybe - mom would buy my brother and me a burger and a soda at their lunch counter. What a sweet story. I remember department store's having a place to dine inside, and they were usually quite lovely. I was very close to my Grammy too, we are so lucky to have such wonderful memories!!! bringing up memories of my nana and our walks across the bridge to gardiner to the department store and diner. sweet story.